The pages that follow, on filtration, explain in detail how a solids handling pump fits in with the whole Cyprio filtration philosophy that has so successfully kept ponds clear for 19 years. disposed of. Titan pumps are specifically designed for this purpose. In addition to filtration, Titans are also excellent pumps for waterfalls and watercourses. This is because they can pump high volumes of water in continuous use, with high resistance to clogging. minimise obstruction to solid particle migration and are specifically placed at the base of the pump in order to collect solids from the floor of the pond. This design maximises the effectiveness of the pump for filtration. All Titans have unidirectional rotation to maximise pumping efficiency, with open impellers to provide the solids handling capability. The Titan 2000 & 3000 use the motor from the mid range Cascades providing unparalleled performance with low running costs. asynchronous motor from the large Cascades. 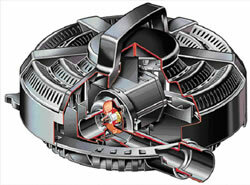 These use stainless steel rotor sleeving to increase magnetic coupling for maximum performance. continuous operation, pumping water laden with solid material. 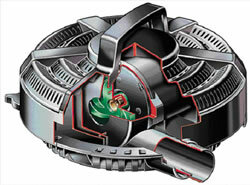 The special design of these pumps ensures that they can confidently be offered with a three year guarantee. All Titans are unique in using TRF protection to prevent motor damage.  Each Titan incorporates an anti clog cage.  In order to ensure the safety of small aquatic life at spawning time the Titan features a unique Wildlife Protection System (WPS). Just slide the lever on the side of the pump to close the intake slot holes down to 6, 4 or 2mm as required. bottom of the pond in any direction from the pump.  Tool free access when maintenance is required.